The Royal Swedish Academy of Sciences today awarded the Nobel Prize in physics to theorists Peter Higgs and Francois Englert to recognize their work developing the theory of what is now known as the Higgs field, which gives elementary particles mass. U.S. scientists, including physicists at UC Santa Cruz, played a significant role in advancing the theory and in discovering the particle that proves the existence of the Higgs field, the Higgs boson. In the 1960s, Higgs and Englert, along with several other theorists, published papers introducing key concepts in the theory of the Higgs field. In 2012, scientists on the international ATLAS and CMS experiments, performed at the Large Hadron Collider at CERN laboratory in Europe, confirmed this theory when they announced the discovery of the Higgs boson. "The award today celebrates an extraordinary achievement, not just the theoretical ideas of Higgs, Englert and others, but also the determined and brilliant efforts of numerous experimentalists, not least of whom are my Santa Cruz colleagues Abe Seiden, Jason Nielsen, and others," said Michael Dine, professor and chair of physics at UC Santa Cruz. "Finding the Higgs signal is an extremely difficult challenge, and the success of the ATLAS and CMS experiments is an amazing feat." Physicists at UCSC's Santa Cruz Institute for Particle Physics (SCIPP) helped spearhead U.S. participation in the LHC and have been working on the ATLAS experiment since 1994. In addition, the work of theoretical physicists has provided guidelines to the experimentalists in their efforts to confirm the existence of the Higgs field. UCSC physics professor Howard Haber is particularly well known for his role in developing theories and the attendant phenomenology of the Higgs boson ("phenomenology" involves the application of theory to experiments in high-energy particle physics). Haber coauthored the definitive book on searching for the Higgs boson, The Higgs Hunter's Guide, published in 1990. "It's great that Peter Higgs and his colleagues finally got recognized. The Higgs field has been the bedrock of our standard model, and it was very exciting last year when the evidence for it came in," Haber said. Noting that the LHC is still in the early stages of its operation and will be ramping up to higher energies in the coming years, Haber said continued experiments may yet reveal new physics beyond the standard model. "It's a long-term program, and we need the full lifetime of the LHC to probe for the possibilities of new phenomena that we're now only starting to get a glimpse of," he said. Higgs and Englert published their papers independently, and did not meet in person until the July 4, 2012, announcement of the discovery of the Higgs boson at CERN. Higgs, 84, is a professor emeritus at the University of Edinburgh in Scotland. Englert, 80, is a professor emeritus at Université libre de Bruxelles in Belgium. After the initial papers were published in 1964, the Higgs boson idea was incorporated into particle physics theories in equations that physicists still use today. "At the time, we didn't have the ability to do experiments at the energy and complexity needed to actually validate the idea, which was very bold, attributing an interaction with a non-trivial vacuum as the origin of particle masses," said UCSC physics professor Abe Seiden, who currently leads U.S. participation in the overall effort to develop upgrades for the LHC. "At UCSC, starting in 1986, we developed a plan for a new charged-particle tracking detector that could be used at a very high-energy accelerator. These ideas were incorporated into the detectors at the LHC, where we joined the ATLAS experiment, one of two experiments that found the Higgs Boson. It is remarkable that after so many years, we managed to validate this amazing idea." 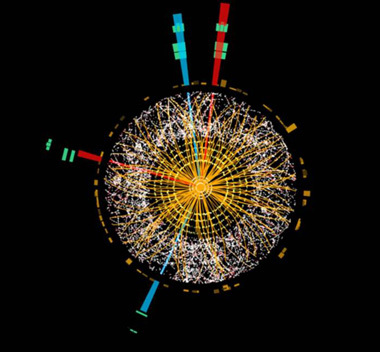 Nearly 2000 physicists from U.S. institutions—including 89 U.S. universities and seven U.S. Department of Energy laboratories—participate in the ATLAS and CMS experiments, making up about 23 percent of the ATLAS collaboration and 33 percent of CMS at the time of the Higgs discovery. Brookhaven National Laboratory serves as the U.S. hub for the ATLAS experiment, and Fermi National Accelerator Laboratory serves as the U.S. hub for the CMS experiment. U.S. scientists provided a significant portion of the intellectual leadership on Higgs analysis teams for both experiments. The SCIPP team has been responsible for developing the silicon sensors and electronics for the ATLAS detector's inner tracker, which measures the trajectories of charged particles as they first emerge from the site of the collisions. The team has ongoing responsibilities for the tracker's operation and is also responsible for some of the particle identification software. The UCSC team includes Abe Seiden, Alex Grillo, Jason Nielsen, Hartmut Sadrozinski, and Bruce Schumm, as well as many students and postdoctoral researchers. The majority of U.S. scientists participating in LHC experiments work primarily from their home institutions, remotely accessing and analyzing data through high-capacity networks and grid computing. The United States plays an important role in this distributed computing system, providing 23 percent of the computing power for ATLAS and 40 percent for CMS. The United States also supplied or played a leading role in several main components of the two detectors and the LHC accelerator. Support for the U.S. effort comes from the U.S. Department of Energy Office of Science and the National Science Foundation. The discovery of the Higgs boson at CERN was the culmination of decades of effort by physicists and engineers, not only at the LHC but at other accelerators and institutions around the world.